As readers will know, I have regularly commented on the relationship between social media and social activism. In the wake of Invisible Children’s KONY2012 and a growing body of literature on the subject, it has been impossible for anyone interested in social justice and political change to ignore the impact of Twitter, Facebook, blogs and other social media platforms on social movements and conflicts. Generally speaking, I have been rather skeptical of the ‘power’ of social media to affect political change. I have argued that outlets like Twitter and Facebook don’t have agency in and of themselves and should be regarded as potentially useful tools for activists. However, it is the people who sacrifice their time, create real-life networks of committed individuals and, in too many cases, sacrifice their lives, who ultimately affect social change. It is they and not Twitter or Facebook who deserve our praise and respect. Moreover, it is important to remember that social media platforms are useful not only to political activists but to authoritarian and autocratic actors who seek to stifle social and political change. With their campaign, UNICEF Sweden has taken aim at the conflation between symbolic allegiances that are built through sharing, ‘liking’ and retweeting and the potential for actual and tangible commitment to political and social activism. The fallacy of this connection was a crucial lesson (hopefully) learned from Invisible Children’s KONY2012 campaign. While millions shared and ‘liked’ the KONY2012 video, when it came to taking concerted action for the ‘Cover the Night’ campaign just weeks after the film was released, the turnout was dismal. 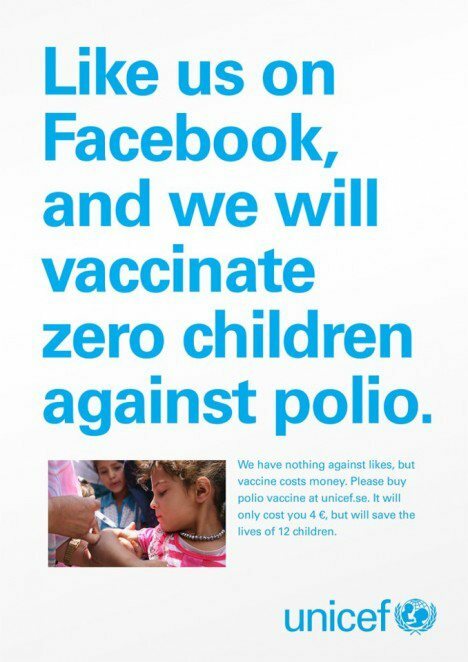 Of course, some may criticize UNICEF Sweden’s message that “money save lives”. There is a propensity amongst some international organizations, particularly those engaging in humanitarian aid and assistance, to ‘throw money’ at highly complex problems. Indeed, we seem to live in a world where the most difficult of challenges we face are dealt with by massive financial commitments: $100 billion for climate change! $25 billion to fight poverty! A ga-zillion dollars to repair the US economy! This belies the complexity and structural nature of many of the gravest global challenges and injustices we face. Money matters. But what matters isn’t simply how much money is raised or spent but how it is spent. In the wake of KONY2012, many asked whether the future of international NGO activism had been forever altered. Would international organizations now do everything in their power to go viral and pile on ‘likes’ and ‘retweets’? Is that how capacity and influence would be now measured? UNICEF Sweden has made it pretty clear: not everyone in the NGO world is going the Invisible Children way. This entry was posted in Activism, Film, Social Media and tagged UNICEF Sweden. Bookmark the permalink. Excellent Article! This has been something that has long bothered me but at the same time I don’t like to think that “clicktivism” is worthless. Anything that shares knowledge of human rights violations/injustices is worthy in my opinion but I do agree with UNICEF Sweden and you(?) on the point that it is not as effective as actual, physical, activism. When most clicking consists just in this and in the passing over to the next clicktivist without any further interest, critical assessment and even less research into the issue, I wonder what kind of knowledge is being shared and to what purpose. Think KONY2012. Except the irony here is that they designed the campaign this way specifically TO garner likes and shares, and to get their message in front of more eyes in precisely the same manner that Kony 2012 did. The only difference is in a different form of clever marketing. And the theory of change is the same — tell a story that people will want to share, and then get more people exposed to your message, some fraction of whom will act in the way you want them to (in this case donate, as opposed to buying the action kit or taking political action).